Charles E. Gunning Jr., born October 26th, 1927 in Roxborough, Philadelphia County, Pennsylvania. Son of Charles E. Gunning and Emma J. (Whitehead) Wise. Married to his beloved wife Dorothy J. Smith for 63 years. 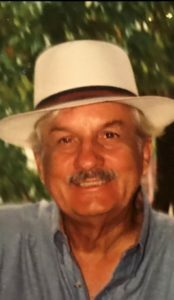 Father of five children, Terry Ann (Victor) Pospischil, Lisa Jane (Robert) Busciacco, Eileen (Normand) Dillon, Daniel (Barb) Gunning and the late Charles E. Gunning, III. Grandfather of Steven C. Kumpf, Jr., Shawn R. Busciacco (Anne), Helene A. Pospischil, (fiancé Charly F. Carlin IV), Bonnie L. Engle (Andrew), Mark E. Pospischil, Shannon T. Gunning, Kathleen Gunning, Great Grandfather of Arik R. Kumpf and Evelyn J. Engle. Brother of Daniel Donahue (Gloria), Brother in Law of Edgar R. Smith and the late Robert J. Smith (Karen). Served as his country as a member of the U.S. Army during World War II. Fondly remembered his years at the Abbey Theater in Roxborough as crew chief for stage performances where he met his beloved wife to be. Employed in his younger years at General Electric working on the N.A.S.A V2 Rocket Program, later became a successful business owner of G&A Electronics Inc, Roxborough, PA. Prolific gardener, horticulturist, oenophilia and vintner. Member and former President of the Venetian Club, Chestnut Hill, PA. Relatives and friends are invited to Charles’ Viewing Thursday 10/18 6-8pm, Craft Funeral Home of Erdenheim, 814 Bethlehem Pike. Services and Interment Private. In lieu of flowers contributions in Charles’ name may be made to Southeastern Veterans Center, C/O Volunteer Coordinator, 1 Veterans Dr., Spring City, PA 19475.